Set aside your preconceptions of postcard scenery, chocolate and cheese, faceless bankers, and spotless cities. The real Switzerland is anything but bland. This small, rugged, landlocked country at the heart of Europe is full of surprises. Adaptable, law-abiding, straight-talking, efficient and honest are all part and parcel of the national character, however all was not always peaceful in this land. Today, "Swissness" is the combination of a high regard for individuality and a strong communal spirit. The country's political makeup greatly reflects this: a Confederation of largely autonomous cantons, each retaining its own unique character, and a strong tradition of direct democracy. Culture Smart! Switzerland reveals the human dimension of this enigmatic country. 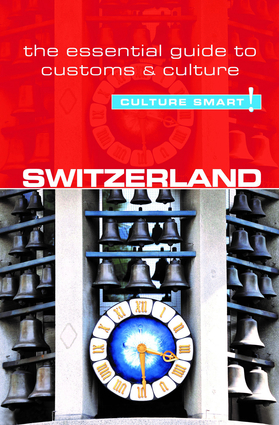 It provides an historical overview, explores Swiss values and attitudes, and looks at the cultural continuity of festivals and traditions. It will help you navigate your way through various aspects of Swiss life and society and reveal the warmth, decency, wit and intelligence that characterises its inhabitants. There is advice on meeting people, on how to behave in different situations, and how to avoid cultural misunderstandings. It looks at the home life of the Swiss, describes what is important to them, how they work, relax, and their perception of foreigners. Crucial insights into business and communication styles are also shared, helping you to discover for yourself the many hidden riches of this fascinating society. The Swiss like to “say it like it is.” They don’t mince words and would never cushion constructive criticism with praise. To a foreigner, this can seem a bit harsh, but it is not meant to be taken personally.